The D315 is a two-stage oil-free screw compressor, designed with a focus on operational safety in demanding applications. 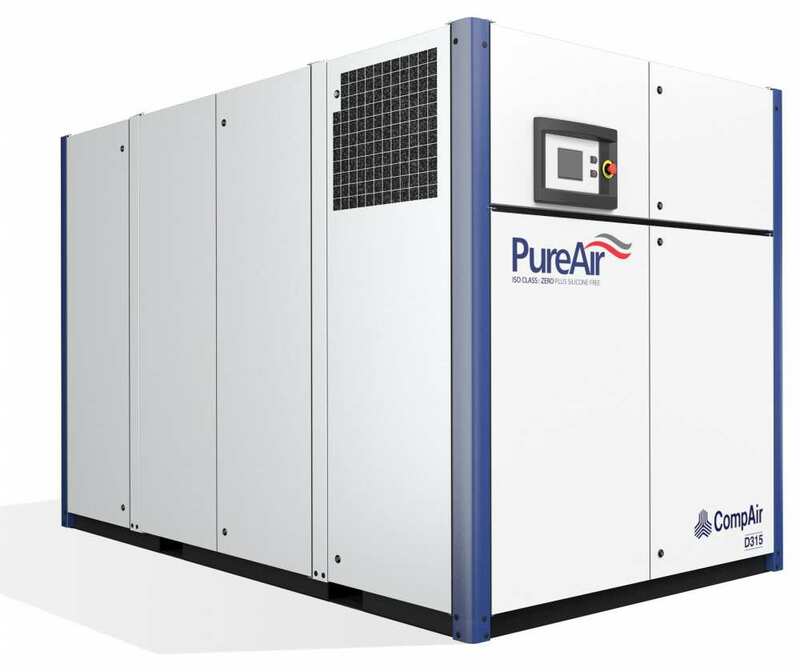 CompAir‘s own airend works at constant low temperature levels and lowers the compressor’s lifecycle costs. The compressor has an inbuilt closed cooling water circuit for the airend cooling, which is independent from ambient temperature. The D-Series offers the highest standard of air purity and has been certified ISO 8573-1 Class Zero (2010) and silicone free. The DELCOS controller ensures reliable operation and protects your investment by continuously monitoring the operational parameters. 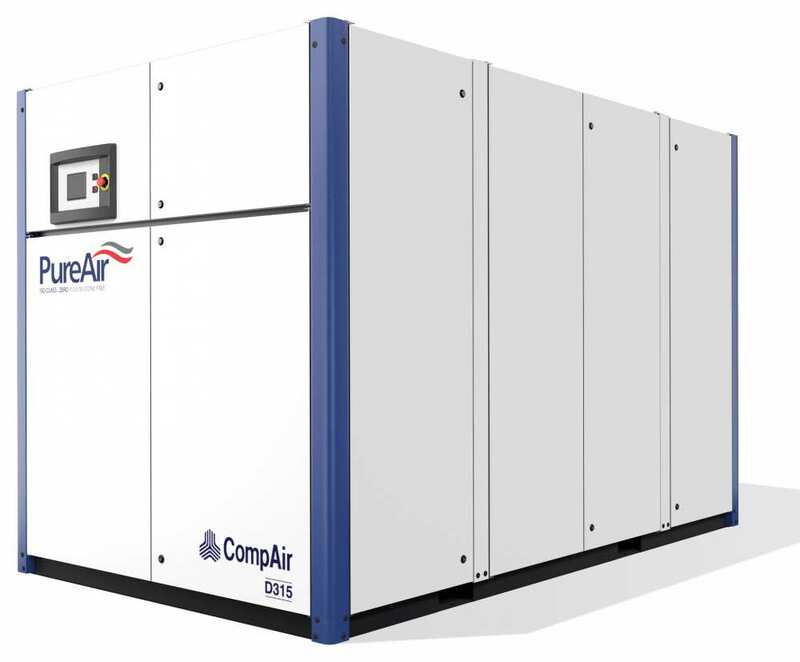 The reduced number of moving parts in the CompAir D315 air compressor combined with the hinged/removable enclosure side doors allow complete access to all service points for short servicing times and reduced service costs. CompAir D315 air compressors can be factory fitted with a heat recovery unit allowing you to recover energy lost in the compression process. Allowing you to save money, energy and reduce your carbon footprint. The CompAir Assure Warranty covers your D315 air compressor up to 44,000 hours or 6 years (whichever is the soonest) giving you complete peace of mind when making your purchase (subject to Terms & Conditions). PureCARE is a specially designed service plan for the CompAir oil-free product range to ensure uninterrupted and uncontaminated compressed air. Each PureCARE service plan is tailored to your specific application and includes CompAir genuine spare parts. The D315 is also available in a variable speed model. The D315RS compressor has the same great features but can achieve greater energy savings by accurately matching your compressed air demand. Do you want to monitor the performance of your compressor? How about with 24/7 capabilities? Interested in leasing or renting equipment? Direct Air can help your business find the most cost-effective solution to finance your compressor and downstream equipment. Technology is constantly improving and for everything that needs to be replaced, there’s always leasing! Regular servicing is essential to keep your compressed air system operating reliably and at optimum efficiency. By selecting one of Direct Air’s service contracts, your system will benefit from planned, regular service visits and genuine spare parts, for complete peace of mind. Complete the form below to contact the Direct Air team with your enquiry. We're happy to explain how all our products work and to help you get started over the phone. Real people, plain English and no obligation.